The crew of the International Space Station has taken the ubiquitous Mannequin Challenge as far as it can go—260 miles above Earth’s surface. 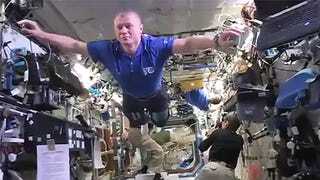 Astronaut Thomas Pesquet shared the video of the ISS crew doing their best to maintain perfectly motionless form while floating in microgravity on Thursday. It takes an enormous amount of discipline to become an astronaut so it should come as no surprise that these fine folks pulled off what will probably go down as the best example of the meme ever put on video. And a courteous Twitter user has even thrown the official M.C. soundtrack, Rae Sremmurd’s “Black Beatles,” on the video clip to make things extra legit. So, now that 2016 is wrapping up it’s time to move on to new memes. The ISS crew wins the Mannequin Challenge and that class of preschoolers officially hold the title of best Mannequin Challenge fail. Do not try again next year. It’s over.